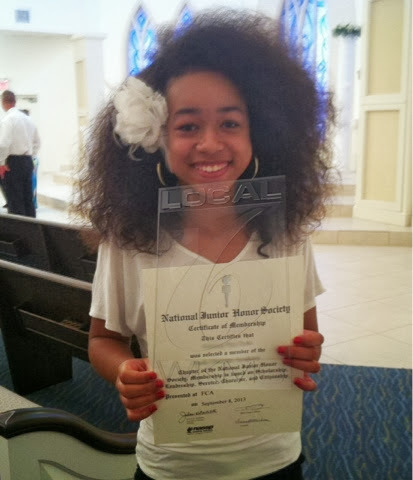 This morning, a story broke about 12 year old Vanessa; a Central Florida girl who was told by her school, Faith Christian Academy, that if she didn't cut or shape her natural hair she would be expelled from the school she has been attending since she was in third grade. According to her and her mother, her hair wasn't an issue until the mother complained to the school that she was being teased for the the appearance of her natural hair. Once the complaint against other students were made, the school decided to address the issue by claiming that Vanessa's hair was indeed the distraction and that she needed to adjust her "mane attraction." I read the news reports and I read the different comments posted by people and I am completely disgusted by the fact that a child's hair in its natural state can lead to her being singled out by adults who have the job to ensure that she has a positive environment to learn and strive. A child, who by the way, is a honor roll student with much success in the same school, who now deems her hair choices unacceptable. The student handbook does have a section on how students can wear their hair. It states that it can not be in an unnatural color or "Distracting." The school clarifies distracting by giving examples of shaven sides, Mohawks, rat tails, and extreme colors, all of which are hair choices and styles that are far removed from the natural appearance of someone's hair and are purposely manipulated hairstyles. My biggest concern about this situation is why didn't the school use this opportunity to teach diversity and acceptance... why weren't the children that are bullying this child told that God created all in a fearfully and wonderfully way and that our differences make this world intriguing and beautiful. It is the responsibility of the adults at this educational institution to teach that our differences should be celebrated and not denigrated. As a high school teacher, I have seen hair distractions, but in my professional opinion, this isn't one. I have natural hair and my daughters both have natural hair, and if this were to ever happen to me or one of them, I would fight it tooth and nail! For so long, many African American girls have felt the need to manipulate their hair into something unnatural so that can fit into a world where European standards are the baseline for what the acceptable standard of beauty is. I commend this girl for taking a stand and wearing her hair in the exact state that it grows out of her head. I will be watching this story and I hope that she and her family are able to fight this slanted and biased action by this school. I personally stand beside Vanessa and I commend her for deciding to embrace her own standard of beauty regardless of the voices around who are encouraging her to blend in. What do you think about this story? What is your opinion on what has transpired at this school? Please sound off below. As always, Be Beautiful, Be Chic, and especially today, BE YOU!! !